Turn your kitchen into a French Bistro in 45 minutes! That's all it takes to create Quick French Onion Soup - the comforting classic. This recipe is perfect for cold wintry days or any day where you want to add a little "je ne sais quois" to your dinner time routine. Onions are caramelized in the MultiPot and then white wine, beef stock and herbs come together to create a beautiful broth. Finally, each bowl is topped with a cheesy toasted baguette. Melt butter in a pressure cooker set to Sauté. Cook and stir onions in hot butter until softened, 3 to 5 minutes. Stir water, white wine, sugar, salt, and pepper with onions. Seal lid on pressure cooker, select Poultry, and cook on High Pressure for 15 minutes. Relieve pressure through the quick-release valve. Pour beef stock into the pot; add thyme sprigs and bay leaves. Seal lid on pressure cooker and cook on High Pressure for 4 minutes. Relieve pressure through the quick-release valve. Remove and discard thyme and bay leaves. Stir sherry vinegar and fish sauce into the soup; season with salt and pepper. Ladle soup into four oven-safe bowls; top each portion with 1 baguette slice and ¼ cup Gruyere cheese. Place soup bowls onto a baking sheet and cook under broiler until cheese is browned and bubbling, 2 to 4 minutes. Gruyere is a semi-soft cheese named after a Swiss village. The cheese is wonderfully complex. At first bite the flavors are fruity, and later it becomes more earthy and nutty. 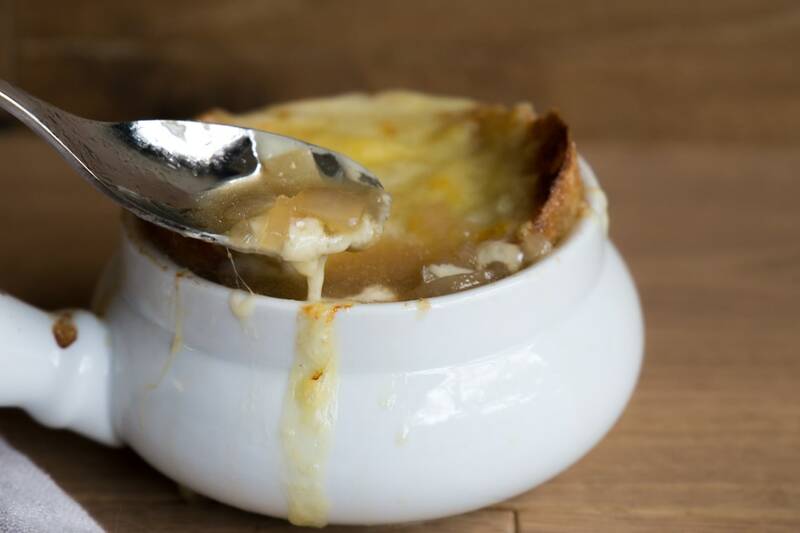 It suits this Quick French Onion Soup perfectly! Per Serving: 217 calories; 9g fat; 24.8g carbohydrates; 9g protein; 26mg cholesterol; 636mg sodium. This cheesy and delicious French onion soup is superb! The Gruyere cheese was the perfect addition to this dish. All of the flavors in the soup were classic and rich. It was also incredibly easy to make, thanks to the quick cooking time of my pressure cooker. I can't wait to make this again! 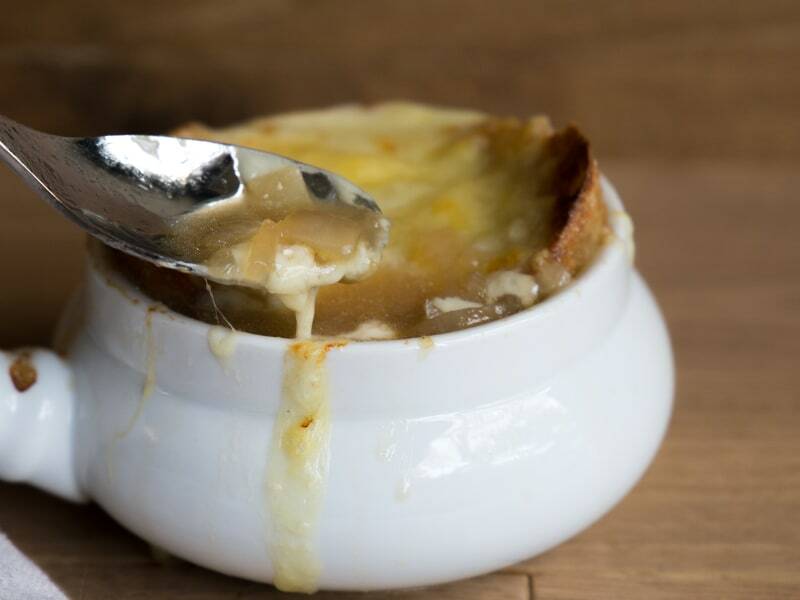 This was a really good, classic French onion soup recipe with rich flavors. Purely comfort food that is especially great for these cold weather days we've been getting hit with lately. Was very good though I would suggest browning the onions until they caramelize a bit, this is when the best flavor and color is achieved. I used brie cheese instead of gruyere and I thought it turned out extra creamy and delicious. The broth was amazing, I wouldn't change a thing. We loved it! I would let the onions brown while sautéing next time but that is just me. Souperb. Thanks for posting and to other reviewers - caramelized onions (both in the pot and on the stove) were key. I made a few additional tweaks for you to consider: substitute beef bone broth for the trendy factor, skipped the sugar (not needed, sweet enough with onions) and drank the wine out of a glass since it was on the ingredients list, but not called for in the instructions. So very good. Thank you, I’m eager to make and enjoy this again.